Think: a Kinect-powered basketball court. SoHo is one of the trendiest neighborhoods in New York City. It's home to hundreds of shops from some of the most popular brands, including Apple, Adidas and, as of last month, Google. Now you can add Nike to this list. 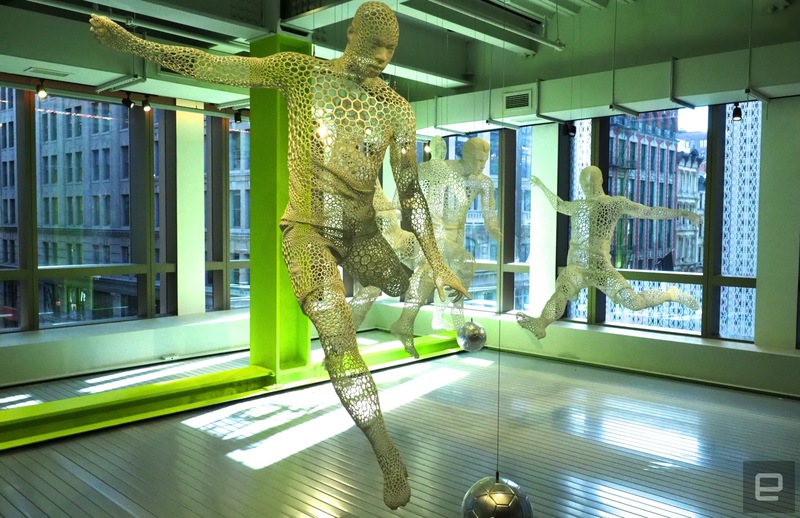 On November 18th, the sportswear giant will open a five-story 55,000-square-foot space loaded with technology, from 3D-printed decorations (pictured above) to a Kinect-powered basketball court. There are also other simple, yet useful, things such as Apple Pay support and large touchscreens on walls that help you call an associate or buy products on the spot. Sean Madden, senior director of service and experiences for Nike's direct-to-consumer division, says the tech inside the store isn't meant to be the main attraction. Instead, he says these features are designed to make the shopping experience more personal. With the hoop, for example, the Kinect sensors are there to capture movements from your body and display those on a massive screen in front of you. That being said, the idea is obviously that you'll use that area to try on shoes you're interested in. I went inside the store, which happens to be near Engadget's NYC office. Here's what else I came across during my tour.